Whenever Kirk McElhearn sets up a new Mac, these are the apps he installs first. Whenever I set up a new Mac, I install a number of utilities that make me more productive, that save me time, or that protect my data. I bought a new MacBook recently, and, as with every Mac, I installed some essential utilities. I’ve been using some of these apps for many years; others are recent additions to my roster of essential software. 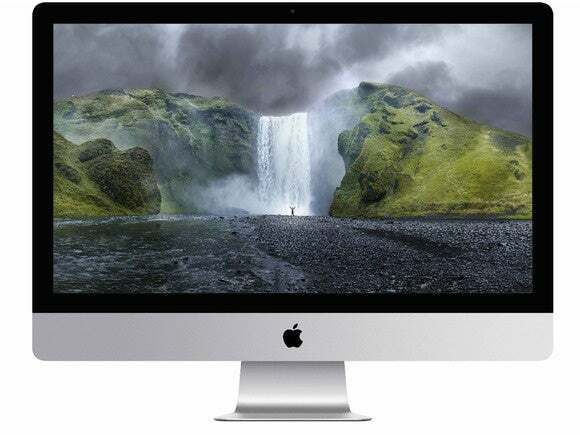 Here’s a look at my 10 essential Mac utilities. The first two apps I install on a new Mac are the ones that help me get everything else set up on my computer. LaunchBar is one of the rare apps that has consistently garnered 5-mouse reviews here on Macworld. I use it to launch apps without needing to rifle through my Applications folder, to move and rename files from the keyboard, to search the web, and to search contacts, calendars, and much more. And I do all this from the keyboard, with just a few keystrokes. 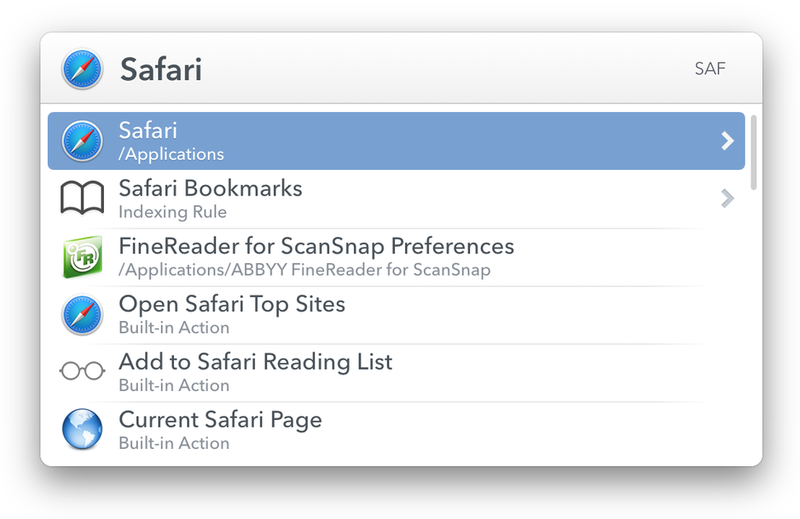 LaunchBar does so many things that it’s hard to summarize this app’s features. Calling it a “launcher” only scratches the surface. If I use a Mac without LaunchBar, I feel like I have two left hands. LaunchBar is more than just an application launcher. Next I install 1Password. With the need for secure passwords to protect your data and your identity, this password manager is as essential to me as a keyboard and a trackpad. It stores all my passwords, and when I need a new one, I use it to create secure, random passwords. But 1Password does a lot more. It’s a repository for software serial numbers, so it allows me to install other apps, those not purchased from the Mac App Store. 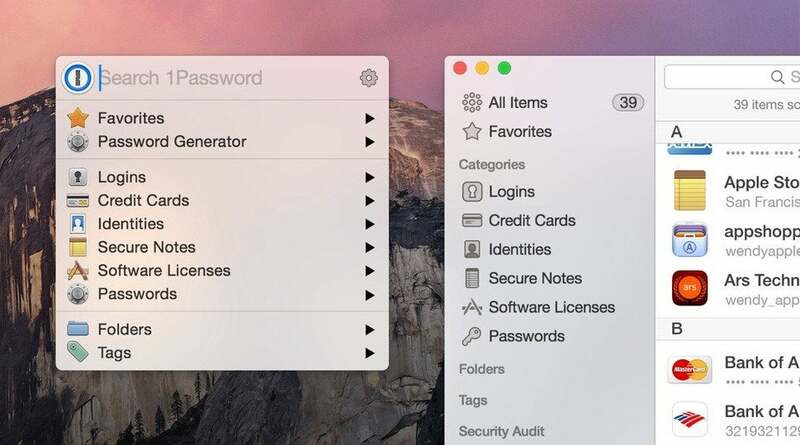 I also keep a number of secure notes in 1Password, containing essential banking information, and and other personal information. The app’s integration into web browsers, using an extension to quickly fill in your login and password on websites, makes life much simpler and more secure. When you write a lot, anything you can do to save keystrokes saves time. TextExpander saves me a lot of time by allowing me to set up abbreviations that the app, working in the background, expands to longer bits of text. I have dozens of “snippets” set up in TextExpander, for quick replies to email (“Please remove me from your list,” for example, for all the junk I get from PR people), app names I type often (iTunes, iTunes Match), my address, my phone number, bits of HTML code, and more. TextExpander also reminds me when I type something frequently and suggests that I create a snippet to save even more time. 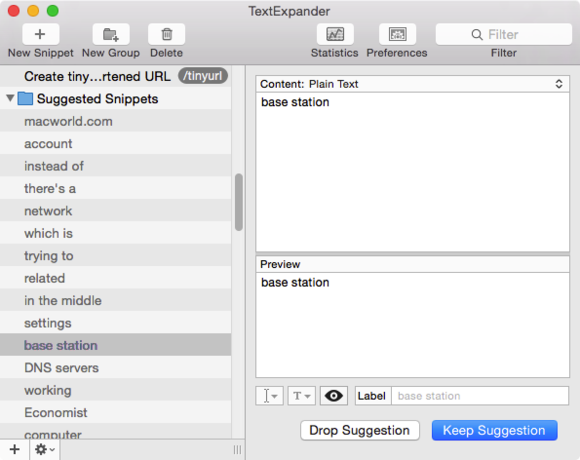 TextExpander 5 watches for and suggests ranges of text you type repeatedly. I get lots of email, and much of it is spam. I’ve tried using server-side spam filters, but there are too many false positives; messages marked as spam that aren’t. To tame my email, I use SpamSieve, a simple utility that works in the background to filter all my email as it arrives, and sort the wheat from the chaff. SpamSieve has a slew of settings that let you determine how sensitive it is, and what it does to your email when it finds spam or ham (good emails). SpamSieve also learns from every new email that you mark as spam or ham, so, over time, it becomes more efficient as it learns the type of email you receive. As I work with my Mac, I like to keep an eye on some system information to make sure everything is running smoothly. iStat Menus keeps me appraised of some important data, such as how much RAM my Mac is using, how busy its CPU is, how much data is entering or leaving my Mac over the network, and more. iStat Menus adds menu extras to the menu bar. Left to right: RAM usage, network throughput, CPU usage, date and time. iStat Menus is always visible in my menu bar, but its display is small and unobtrusive. Whenever I want to check something, a quick glance shows me what’s happening. Clicking any of these graphs displays more information. For example, if I see that my Mac’s CPU is running hot, or there’s a lot of network throughput, I can click to view a menu and find which app is the culprit. iStat Menus also offers better menu extras than Apple’s for my MacBook’s battery status and for the date and time. I listen to music a lot while I work, and iTunes runs all day on my Mac in the background. When I want to pause music, change the volume, or skip tracks, I don’t like to have to switch to iTunes and click its buttons; I prefer doing it more quickly. I’ve never cottoned to using the media keys on Apple’s keyboard, since they’re just a bit too far too reach easily. 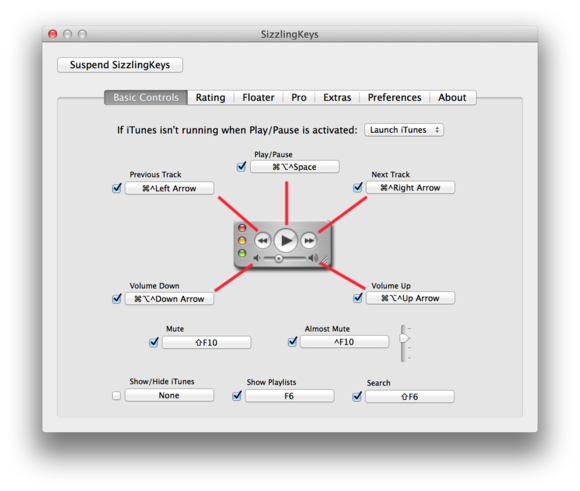 Sizzling Keys lets me use a number of custom keyboard shortcuts to control iTunes, rate tracks, and even display a floating window showing what’s playing. 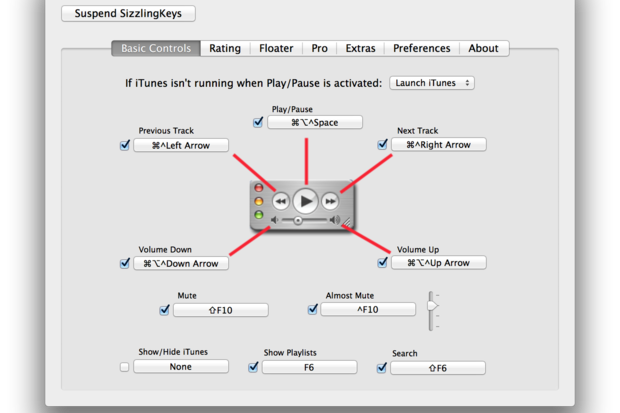 There are lots of other ways to do this, but I find Sizzling Keys the easiest and most flexible iTunes controller. Another utility I use with iTunes is Airfoil Speakers, part of Airfoil. Airfoil is designed to let you stream audio from a Mac to all sorts of devices, and it is an essential tool for doing this task. But Airfoil Speakers works in the other direction: it turns any Mac into an AirPlay receiver. This allows me to stream music from my MacBook or iPhone to my iMac. This is very useful, because I only use Apple Music on my MacBook, and I manage podcasts on my iPhone using Overcast. Airfoil Speakers stays dormant in the background until I need it, but when I want to stream any audio to my iMac, it lets me do so transparently. I just select it as an AirPlay device from another Mac, or from an iOS device, and the sound goes through my iMac. 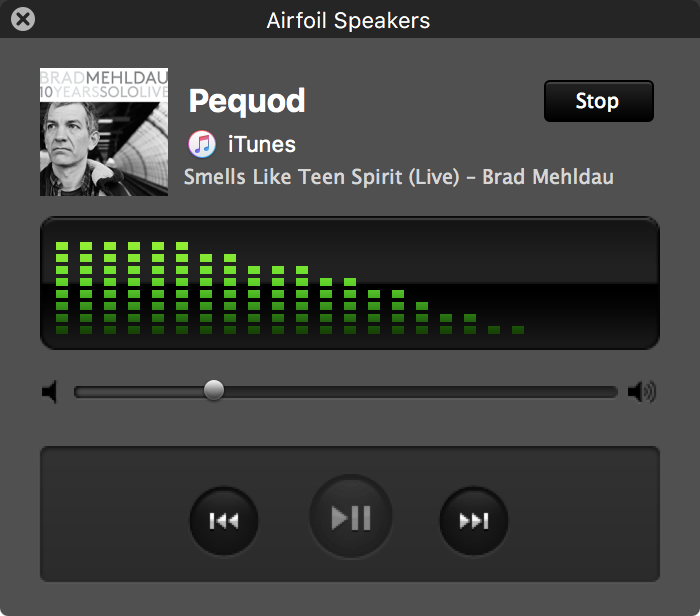 Airfoil Menus turns any Mac into an AirPlay receiver. When you have key files you want to be able to access on multiple devices—computers or mobile—the cloud comes to the rescue. Like many people, I use Dropbox, which allows me to not only access important files on my iMac, MacBook, iPhone, and iPad, but also to share files with others. I work on a number of collaborative projects, where shared folders allow me and others to work on the same files. And Dropbox’s Public folder allows me to share large files with friends and clients, sending them a link they can use to add the file to their Dropbox folder, or download it from the web. Dropbox is an essential tool for much of my work. I work with two Macs: a 5k Retina iMac and a MacBook. There are a number of files I like to be able to use on both of these computers, and, while I could use Dropbox to sync them, it’s not the fastest solution for local syncs. I use BitTorrent Sync to keep a few folders in sync across my two Macs. Set up the app, add a couple of folders, and every time you make a change to one of them, BitTorrent Sync transfers the new files and deletes the ones you’ve trashed. In addition, my MacBook is my test machine, and I often take screenshots on that Mac to use in articles I write. So I put my screenshots in a dedicated folder, which syncs from the MacBook to my iMac. It’s nearly instantaneous, and it makes my life easier; I no longer have to mount network shares to transfer files from one Mac to the other. And it’s a whole lot more reliable than that AirDrop thing, which never seems to work. Last but not least is the tool that keeps my files safe: Carbon Copy Cloner. There’s nothing more important than backups, and I have a complex strategy where I run two Time Machine backups, as well as several backups of my startup volume, my media disk, and other files. 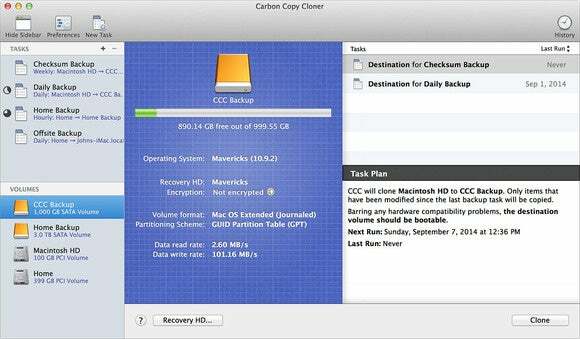 Carbon Copy Cloner handles all this, allowing me to set backups to run overnight, to copy key files to external drives, and to clone my entire startup volume. If anything happens to my Mac, I can always boot from that clone, and even restore it to the Mac. The app can mount external drives automatically before backups, and eject them when it’s finished. With Carbon Copy Cloner, I can be sure that my files are protected.